The weather noticed that it is June, and June is supposed to be hot in New York – so the temperature jumped right up to 90. It’s cooling off a little now, but since summer doesn’t even officially begin until tomorrow, I know this is just starting. It is time now to think of food that not only is served cold, but feels cool… crunchy salads, icy popsicles, and cool, slippery aspic. Here I’m just giving a very basic recipe – the one my mom made, the one I learned to make when I was in my teens. 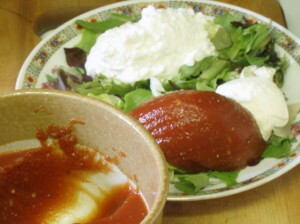 I vary it a little – I learned to make it with tomato juice, but now I more often use V-8 (or some version of the same.) When I’m feeling fancy, I make it in molds – this fills a 2-cup ring mold nicely, or I make it in 4 half-cup molds, and it can be very pretty. This time, though, I just made it in a bowl, and am scooping it out – no fuss. Now, we never did the classic American Molded Jello Salad. My aunt did – and, though she was a good cook, that was the one thing she served that I really never liked. Tomato aspic, though, which is savory, rather than sweet, can fit in the same place – a cool pretty mold that can hold plenty of chopped or grated vegetables. 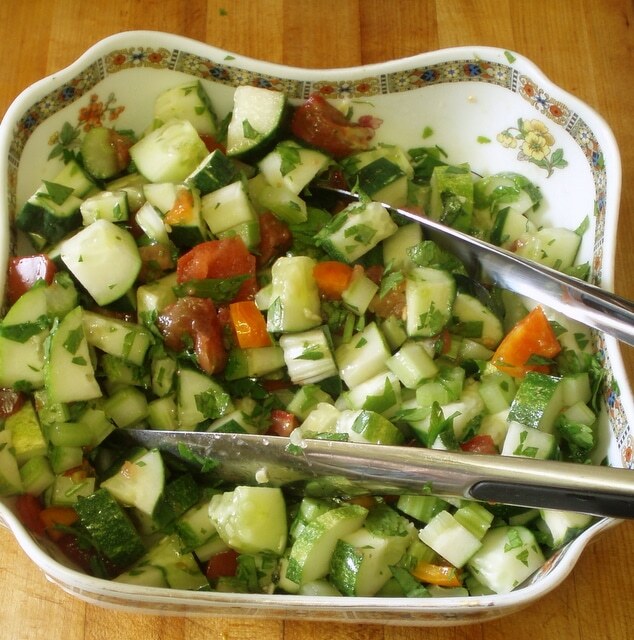 Aspic can also be made with fresh vegetables, instead of the canned juice from the store. Another time I’ll write about versions of that, and we’ll do the fancy company version. This, though, is the foundation recipe. Here in the US, plain, unflavored gelatin comes in little 1 tablespoon packages, which are enough to gel 2 cups of liquid. I know there are other versions elsewhere – my mother spoke of opening the box in Denmark, looking at the papery sheets, and thinking they’d forgotten to pack the powder! (Our very helpful landlady told her how to use sheets of gelatin.) Since gelatin is an animal product (I understand that even Kosher Parve gelatin is made from fish) vegetarians generally use agar flakes – but they work a bit differently, and you need a recipe designed for them. This won’t quite work with agar. 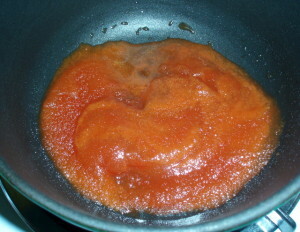 Gelatin needs to be softened, and then melted into the liquid to begin with. 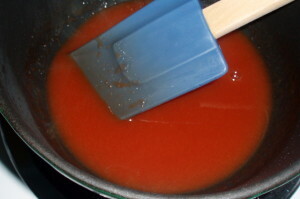 Take a small saucepan, and put half a cup of your tomato or vegetable juice into it. Then, open the packet of gelatin, and sprinkle it carefully and evenly over the surface. For a moment there is a thin white layer, but I couldn’t move quickly enough to get a picture of that. I think you can see, though, that there is something on the surface. At this point, let it sit for about 10 minutes, to soften. Now, the layer has thickened a little, and is soft and sort of wrinkly. Put the pot over a low heat, and start stirring. The gelatin will start melting quickly – you’ll see it start to clarify, so you only see the juice, not the lighter thickened part. As soon as it is completely melted, take it off the heat. Now, stir in another cup and a half of juice, and any seasoning you want. I add a dash of Tabasco – other hot sauces will work well, amounts varying by both their heat and your taste. If you use an unsalted juice, you might want to add just a sprinkle of salt – less than is used commercially, but it will still add a lot to the flavor. I use the standard, so I don’t add any salt, and do specifically choose an unsalted seasoning mix – just a few shakes of Mrs. Dash. And a tablespoon of lemon juice adds sparkle. Stir this all together. If you are using a mold, rinse it now with cold water (to help with the later unmolding.) I used a bowl, so I just poured it right in. Then put it in the refrigerator for at least a few hours. I usually make it the night before, planning to use it for lunch. And there we are. 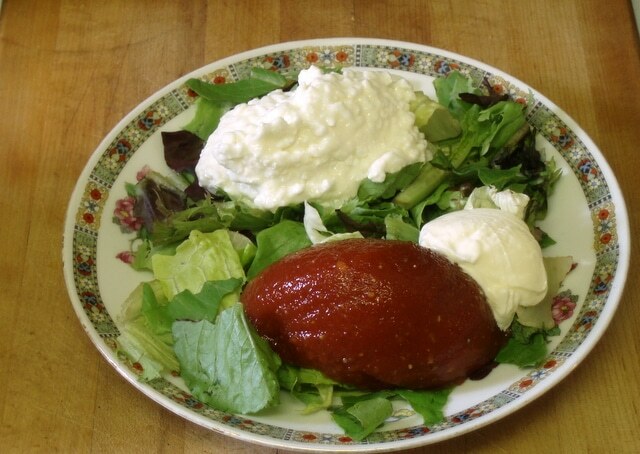 A spoonful of this, I like to add a dab of mayonnaise, with a spoonful of cottage cheese, on a bed of mixed greens – a lovely hot weather lunch! 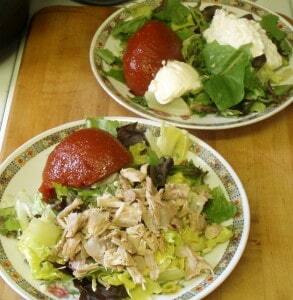 (Of course you can skip the cottage cheese – Rich chose some leftover meat, instead.) And, though I think of this as a cooling summer dish, it can be a nice change in winter – made with the canned juice, it gives a little life to limp midwinter salad greens. Put a half cup of juice in a small saucepan. Sprinkle the gelatin over the surface, and let it soften for about 10 minutes. 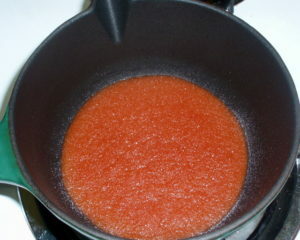 Then gently heat the juice, stirring, until the gelatin melts. Stir in the rest of the juice, and all other ingredients. Pour into a bowl or 2 cup mold. Refrigerate 4 hours or longer.